For nearly 6,000 years, ancient architects have incorporated ceramic tile in their building projects. Ceramic tile was used during the construction of buildings, walkways, and courtyards. In fact, its tough structure helped to make it a top material choice for outdoor tile projects 1000’s of years ago. 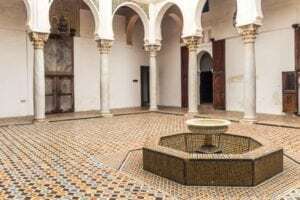 Its tough exterior shows to stand the test of time through Italian, Turkish, African and Mexican cultures, where you can still find ceramic tile in mint condition. 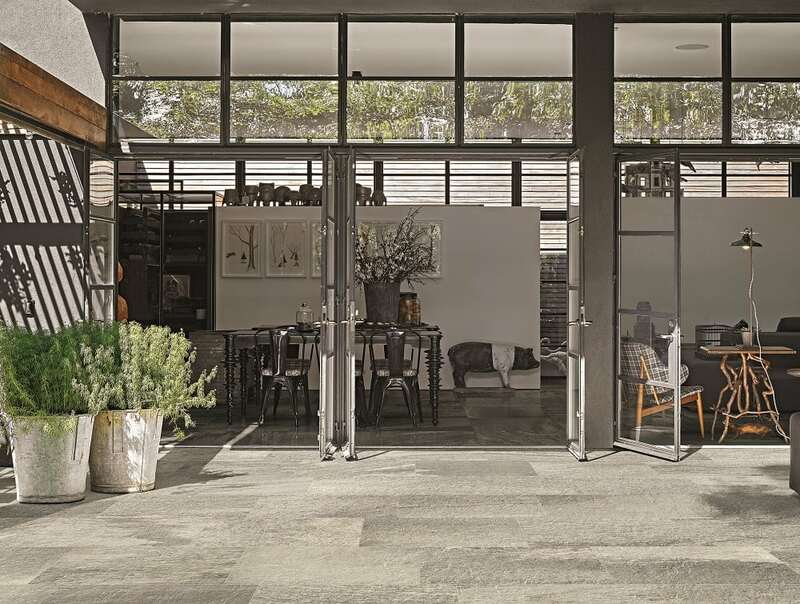 Now, fast forward thousands of years to today where ceramic tile comes to us in the form of porcelain tile, a much more durable product that can withstand the rigorous outdoor elements in variety of climates. 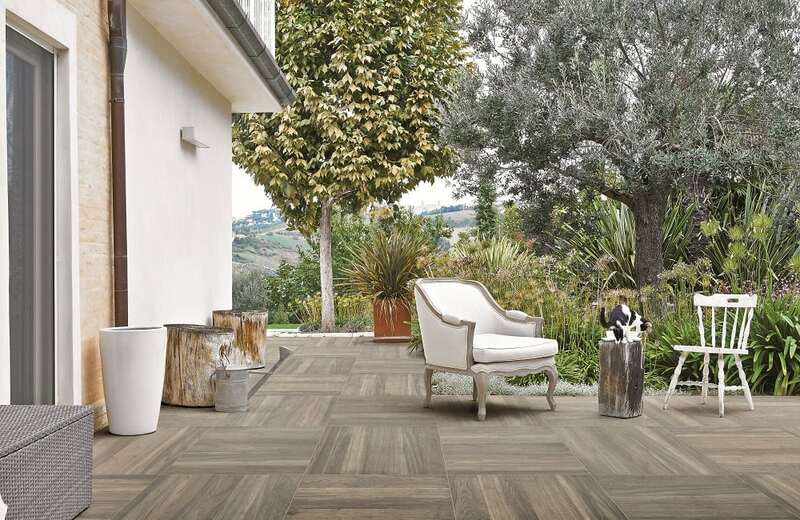 Porcelain wood tile like this one from Cotto D’Este’s Cadore series is a popular design option in outdoor porcelain tile. Unlike ceramic tile, porcelain tile is impervious, meaning it has a water absorption rate of 0.5 percent or less; therefore, using porcelain tile outdoors in a climate that experiences freezing conditions can be very beneficial to the homeowner. In sub-freezing temperatures, the water will not enter the tile and cause it to crack or the glaze to be damaged, which gives homeowners peace of mind. This non-porous tile allows little to no dirt to accumulate on the surface. With very few holes in its structure, it provides homeowners with a cleaner surface that requires little up-keep. We do recommend that homeowners occasionally sweep and clean the tile with warm, soapy water to help keep it beautiful. If you are choosing to use porcelain as an outdoor tile, we do recommend choosing a tile with a textured surface that makes it more slip resistant. Surfaces labeled as “textured” or “flamed” are typically great choices for outdoor tile installations. We are sure that homeowners want to find a material that will last the stand of time. 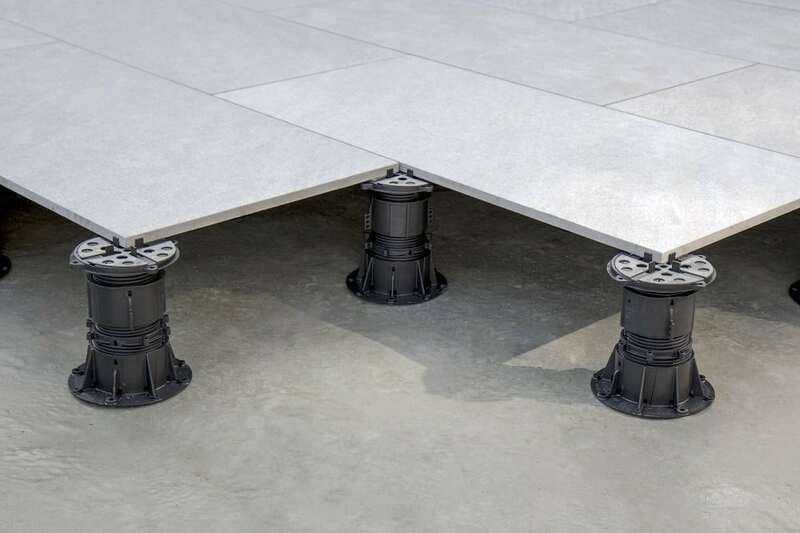 With porcelain tile, you are guaranteed an extremely durable material. In fact, it is extremely difficult to scratch its surface. Plus, you do not have to worry about fading. Porcelain tile is unaffected by UV light and will not fade over time, making it the perfect choice for your outdoor area. Milestone (formerly Florim USA) Outdoor wood look. Finally, the use of porcelain tile outdoors allows for a seamless installation from your indoor living space to your outdoor patio which few floor covering choices can provide. With porcelain tile, the party never has to end. Quite literally, you can move freely from one space to the next without any interruption in the design. Porcelain tile gives homeowners the flawless transition that they have always desired while creating a beautiful, timeless outdoor oasis. Seamless from the inside to outside. Casa Dolce Casa’s Flagstone series has many applications whether is for the interior or exterior. In recent years, porcelain tile manufacturers began producing a 2 centimeter (3/4″) thick porcelain tile that is even more extraordinary than the traditional, 3/8″ thick porcelain tile. 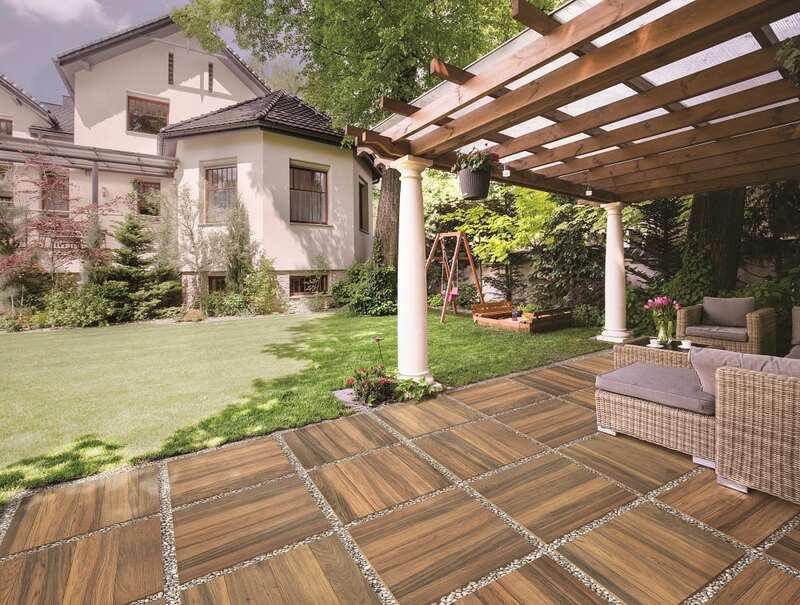 Commonly referred to as 2” cm porcelain, this tile is specifically built for the outdoors and provides a wide variety of ways it can be installed and enjoyed making it even more ideal for patios, rooftops, pool surrounds, driveways and more. Easy installation and removal. If you ever move you can actually take this with you!! 2cm porcelain tile can be loose layed on stone, grass and sand. Pictured is Milestone (formerly Florim USA) Outdoor Cherry Wood. 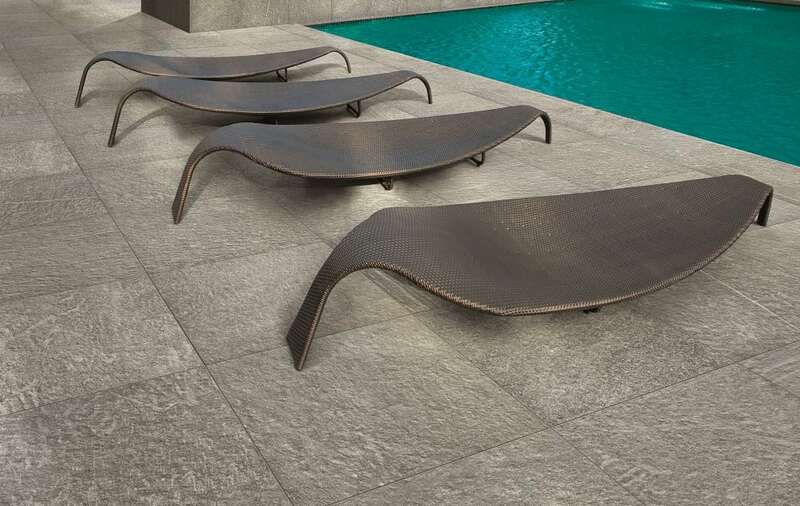 A textured porcelain tile is perfect for pool surrounds. Pictured is Milestone’s (formerly Florim USA) Outdoor 2cm Manhattan Grey. Do you love the idea of having porcelain tile outdoors? 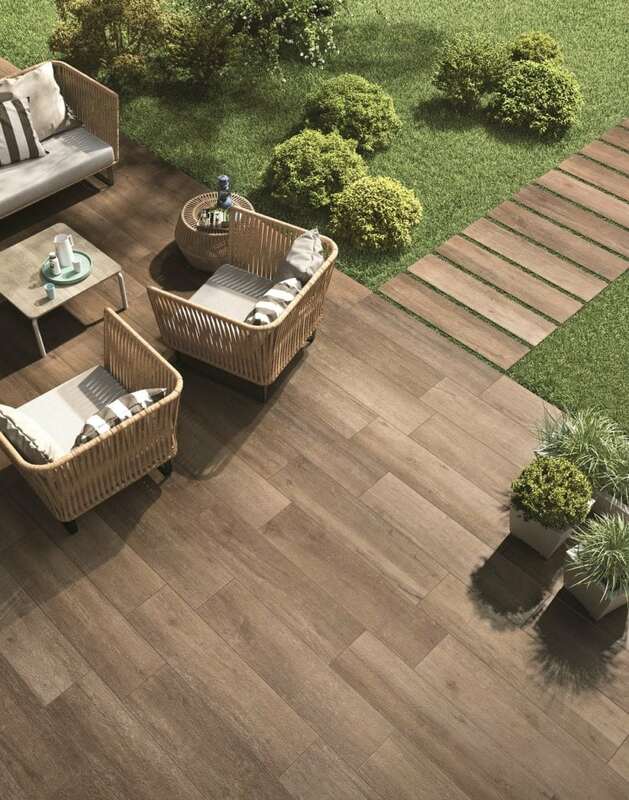 We would love to help you find the perfect porcelain tile for your outdoor space. Check out more photos of tile being used outdoors on our “Inspiration” page or visit our “Products” page to see the many outdoor options. Please do not hesitate to call us at 1-800-422-6860 with any questions or visit our stop by a showroom near you to see our products. We look forward to the opportunity to work with you. Casa Dolce Casa Flagstone is used to create this dramatic outdoor area.